Presidency explains why Ekiti state governor, Ayo Fayose, is not part of the governors visiting President Buhari – Royal Times of Nigeria. The Presidency has explained why Ekiti state governor, Ayo Fayose, is not part of the state governors that would be visiting President Buhari in the UK later today. Senior Special Assistant to President Buhari on Media and Publicity Shehu Garba, Special Adviser to President Buhari on Media and Publicity, Femi Adesina and Special Adviser to acting President Yemi Osinbajo on Media and Publicity, Laolu Akande, had a joint press conference with state house correspondents in the villa in Abuja yesterday where they spoke on the visit. Adesina was asked why the Ekiti state governor who is very critical of President Buhari was not allowed to be part of the delegation to see President Buhari. 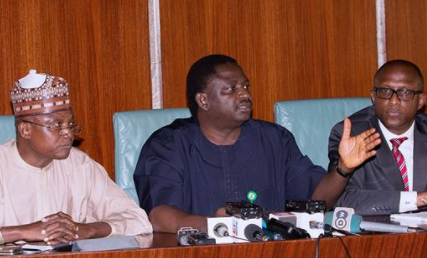 Adesina in his reply said the presidency had no hand in the selection of the delegates to London. He said: “The selection was by the governors forum and you will see that the delegation is headed by governor Yari who is chairman of that forum. So that question should go to the forum”.